Fortrose Academy’s ‘Venture’, ready to run for us! Please sponsor the Fortrose Academy students running for us in the Inverness 5k, on the 10th March. They have already doubled their target, let’s try and triple it! A huge thank you to Donald Ferguson and Stuart Patience on raising £300 for Black Isle Cares at last month’s ‘Beast Race’. The local boys also claimed 14th and 15th places in the race, that’s quite an achievement. This is the second year in a row that they have raced for our charity. Thank you both very much and well done! 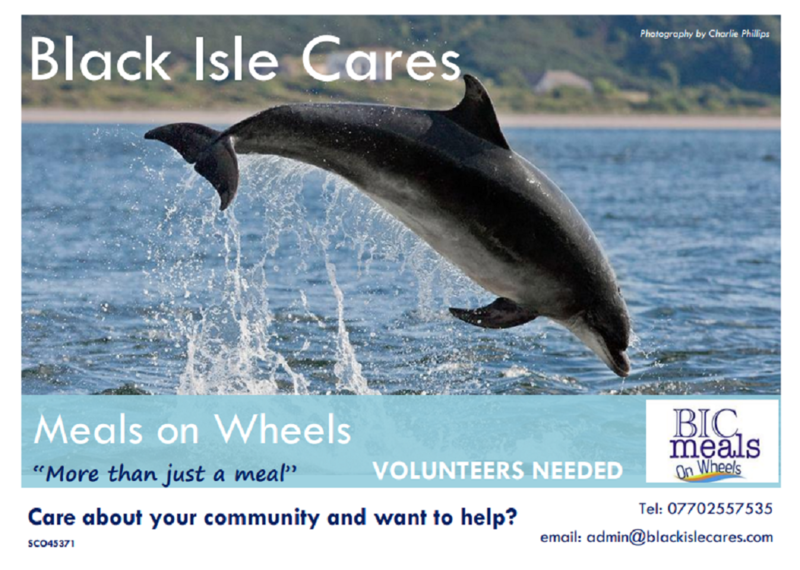 If anyone wants to fundraise for Black Isle Cares then please get in touch through our website’s contact page. We can provide you with inspiring ideas, also with sponsor forms and set up a fundraising page for you on BT Mydonate. Imagine having the right kind of help at the touch of a button, any time day or night. Telecare is the use of technology and sensors to provide support and assistance at a distance. It gives you the freedom to live your life, safe in the knowledge that you can call for help quickly if you ever need it. To see how telecare could help you or someone else complete the Telecare Self-Check Online Tool. Visit www.telecareselfcheck.scot. When a telecare sensor is triggered it will automatically raise an audible alarm and contact the NHS Highland Hub Response Centre (HUB) in Inverness, which is open 24 hours, 365 days a year. Trained operators at the HUB will provide reassurance and take the most appropriate action, which could be to contact the emergency services or your volunteer responders. Responders are people you know, such as your family, friends or neighbours, who are willing to be contacted should you require assistance. The role of your responder is to provide support, reassurance and assistance in the event of alarm activation. We will never expect a responder to put themselves at risk. All telecare clients are offered our basic telecare installation which consists of: A base unit – this is a small box which is connected to your telephone line and a nearby electrical socket; a 100% waterproof body trigger – this can be worn around the neck as a pendant or around the wrist like a watch; and a smoke detector – this is linked to the HUB. Basic Telecare is a great option if you are already independent but feel you could benefit from extra security and peace of mind in your own home. You will also benefit from extra fire protection as our smoke detectors are linked directly to the HUB who are able to call emergency services on your behalf. Bed sensors – Used to detect when an individual gets out of bed during the night and fails to return after a certain time period. Medication dispensers – Automatically dispensed medication and provides an audible and visual alert as to each time medication should be taken. Passive infra red (PIR) sensors – PIR sensors detect “non-movement” which could indicate a fall, and also “movement” which could indicate a person has got out of bed or is about to enter a dangerous area. Temperature extreme sensors – commonly used to detect low temperature in the person’s home and alert if at risk of hypothermia. Enhanced telecare devices are designed to be discreet and act as an early alert system to various risks such as wondering, thus enabling people to stay at home for longer. If you are a live in carer, you may benefit from the ‘Care Assist,’ a portable pager. The Care Assist will produce an audible alarm and vibrate when a telecare sensor is triggered, so you can respond quickly to any situation that might arise. Additionally, we can link all devices to the HUB, giving you the freedom to safely leave the home, knowing the HUB operators will contact you if needed. There is a charge of £6 a week for the Telecare service. A financial assessment is offered to all telecare clients to determine eligibility for free provision of the telecare service. There is no extra charge if you require replacement or additional telecare equipment. You will also receive yearly maintenance and free low battery replacement for your telecare equipment. A mains socket within a metre of the main telephone line. How do I get telecare? If you are receiving care from a community care team or have an assigned social work team, please contact them in the first instance as they will be able to complete a referral for you. Once we receive your telecare referral we will contact the Highland Handyperson service who will arrange a visit to install your telecare equipment and show you how to use telecare. The Handyperson is a service available for people aged 65 or over who have difficulty carrying out small jobs around the home and for people of any age with a disability. Telehealth is the use of technology to provide healthcare at a distance. NHS Highland’s Technology Enabled Care (TEC) team is currently using Simple Telehealth, also called Florence (or Flo for short), to support and monitor people with a wide range of health conditions and challenges. Florence is an automated, interactive service which uses mobile phone text messages to monitor symptoms and to provide reminders, advice and support. Florence protocols (a protocol is a programme of text messages) can help patients to understand, monitor and manage their own health condition, treatment or lifestyle. Anybody with a mobile phone can use Florence – it doesn’t have to be a smartphone. There is no charge for using Florence, and there is no charge for sending or receiving the text messages. Telehealth is designed to help people living with long-term health conditions or people who are struggling to make positive changes to their lifestyle. If you have a long-term health condition, or need some support making a lifestyle change, Florence could help you. Florence can help you understand your health condition, allows your symptoms to be monitored remotely by your healthcare provider, and can reduce the number of appointments you need with health professionals e.g. GPs or specialist advisors. Asthma or COPD – Florence sends regular text messages asking you to check your peak flow or your SATS, and then, depending on the reading you provide, gives appropriate healthcare advice. For example, if your peak flow is less than 50% of your best peak flow, Florence will tell you to dial 999, or call your GP urgently and what steps to take until help arrives; if your SATS are low, Florence will ask about other symptoms, and may suggest you consider taking your rescue medication, before your exacerbation worsens. My Steps Count – Florence asks for the number of steps you have taken each day, recorded using a pedometer, and helps you to gradually build up the number of steps. The protocol can support people who are struggling to be a little more physically active, through setting their own targets and encouraging them to meet those targets. Florence is a simple, interactive telehealth service that provides support to patients by automatically sending out a programmed series of text messages (called a Florence protocol). Patients receive messages offering tips, support, advice and reminders, and also messages asking them to send in readings – depending on the Florence protocol readings may include peak flow, SATS, blood pressure, weight, and many more. Clinicians can log in to the Florence website to see patient readings and (if they wish) can edit messages and targets sent to patients. NHS Highland is currently using the Florence Service to help patients understand, monitor and self-manage a range of conditions and challenges, including: Asthma, high Blood Pressure, COPD, Diabetes, Epilepsy and Heart Failure. Florence is also used to provide support and reinforcement for people attending a range of courses, or therapy sessions, run by NHS Highland staff, including courses for anxiety and depression, chronic pain, eating disorders, inflammatory arthritis and a range of mental health issues. Florence is being used to provide reminders, support and advice, as well as monitoring, in a variety of situations, including for people at risk of falls, during pregnancy, during the first weeks after giving birth, and for those introducing the low FODMAP diet for IBS, suffering from lymphoedema and who need to do physiotherapy exercises, amongst many others. Some healthcare professionals may ask you to complete a survey relating to your symptoms, using Florence, so that they have the information provided by your answers before your next appointment. For example, the ARM-A protocol for people with spasticity. How do I get Florence? Most Florence protocols are only available through healthcare professionals – your specialist nurse, consultant, physiotherapist, GP or practice nurse. If you think one of the Florence protocols might be helpful for you, please speak to your health provider to find out if they are currently offering Florence. If they aren’t, you could suggest that they contact the Technology Enabled Care (TEC) team to find out about Florence. Help you to “Reach Out” to people who are lonely or socially isolated, by providing tips, reminders, and monitoring, via text messaging – to encourage people to support NHS Highland’s Reach Out campaign. If you would like to sign up to Reach Out, please contact the department to give us your details. Once we receive your details we will sign you up to Florence – and you will receive your first message. You will have to opt in, by texting YES, before you can receive any further messages. Once you have opted in, we will send out your pedometer or Wellbeing booklet by post. N.B. there is no charge for sending text messages to Florence EVEN IF your phone tells you that you will be charged. Your details will be stored in accordance with data protection legislation and will only be used for admin related to the Florence protocol you are signed up for, and evaluation of its success. An internal evaluation of NHS Highland’s Florence service was undertaken early in 2018 by Flora Jones, and the evaluation report finalised in April 2018. The Florence protocols evaluated for the report were: Asthma, Low FODMAP Diet, COPD, Pelvic Floor Health, STEPPS, Healthy Weight and Blood Pressure Monitoring.